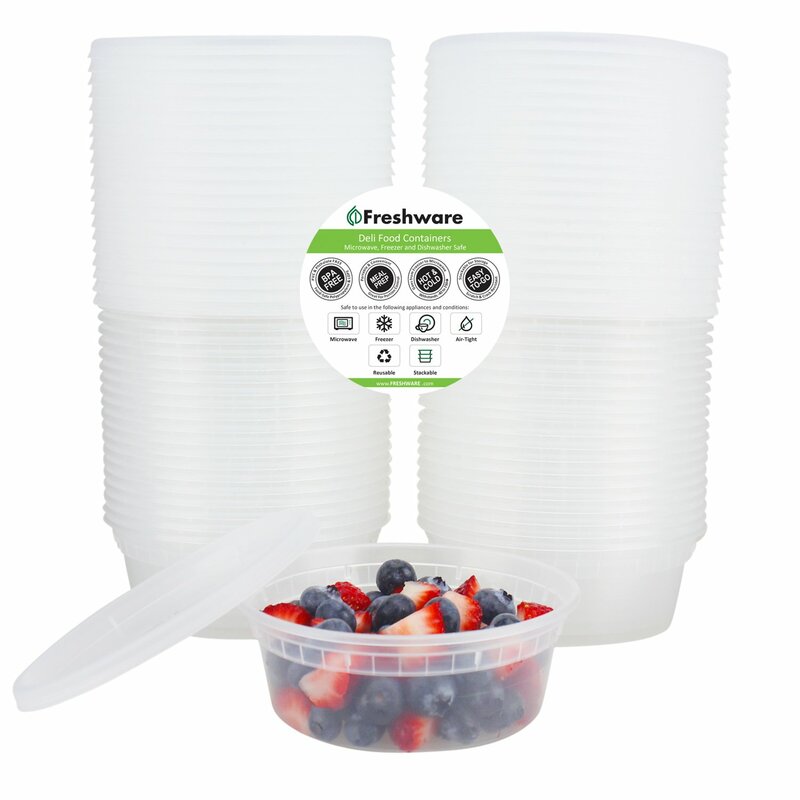 Home › Home and Kitchen › Freshware 40-Pack 8 Oz Plastic Food Storage Containers With Airtight Lids - R..
Freshware 40-Pack 8 Oz Plastic Food Storage Containers With Airtight Lids - R.. THE ULTIMATE DELI FOOD STORAGE CONTAINER SET OF 40: If you are looking for ways to make your everyday life easier, then we got you covered. Our 40 reusable plastic food storage containers are the way to go. Made from high quality materials and with the most affordable prices, our containers will become your lunch buddies everywhere you go. They have the perfect size: 4.6 inch top diameter x 3.4 inch base diameter x 1.7 inch height. Volume: 8 ounce/0.4 pint to accommodate all your needs. HIGH QUALITY 100% BPA FREE PLASTIC STACKABLE BENTO BOXES: These 8 oz bento boxes are especially designed from high quality BPA and Phthalate free plastic, so as to keep you and your beloved ones safe. No more worries about harmful toxins and chemicals since your food is safe from now on. They are crack-resistant so even your kids can use them too. Being stackable as well, they will allow you to stack them nice and easy either in the freezer or in your backpack. The Ultimate Food Storage Container Set Has Just Arrived! Are you fed up with poor plastic containers that would create a mess in thekitchen? Do you hate spending a fortune on expensive Tupperware? Are youlooking for a handy little container to pack your kid's favorite snacks? If the answer to those questions is yes, then you should keep on reading. Wehave designed the perfect plastic food storage containers to fulfill all ofyou daily eating, lunching and snacking needs to the fullest. Containers To Go For Meal Prep, Portion Control, 21 Fix Day & Other Uses These plastic containers are suitable as your kids lunch box, as a bento boxfor work or like most fitness experts have recommended as meal preps andportion control containers. You can place inside anything that comes in mind. From dry fruit, vegetablesmoothies, soups, pasta, to stews, spicy sauces, deli meat and any other foodthat you like. You may rest assured that their leak proof lids will keep all of your foodinside without any leakage or spilling issues. Extremely Stackable Food Storage Containers That Can Fit Almost Anywhere Our food containers are easily stackable in refrigerators, coolers, freezersor any other place you might think of. Your gym locker, your kid's school bag,a picnic basket, a backpack or even a handbag. Hassle free storage has finallybecome a reality. These food containers are able to withstand extreme temperatures from -40 to250 degrees Fahrenheit (-40 to 121 degrees Celsius). Pure perfection right? What are you waiting for? Get your set today and one as a housewarming gift toa friend. GET IT WITH CONFIDENCE: Freshware offers you their best free replacement or refund policy in any case! Your Purchase Is Risk Free. ADD TO CART TODAY!